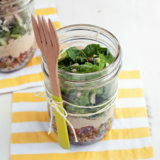 Like a mini grain bowl on the move, these hearty, protein-packed mason jar salads are layered with tabbouleh, hummus, greens, and toasted pine nuts. So easy and, frankly, darn cute! Something about this time of year screams to me GET YOUR LIFE IN ORDER MAN! Even when there’s no back-to-school in my life, fresh starts permeate the air. And nowhere do I feel the urge to get it together more than in the kitchen. Make-ahead, freezer, Crock Pot, it’s all on my mind. So it pleases me to no end when I have a lunch all ready-made, just waiting in the fridge. 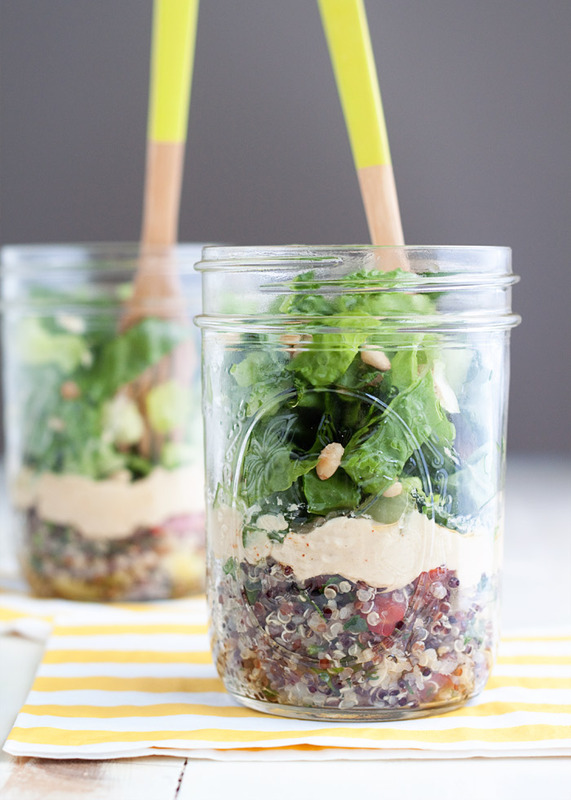 These Tabbouleh Hummus Mason Jar Salads aren’t just a convenient lunch. They say I’ve got my stuff together, man. And now I’m ready for fall. 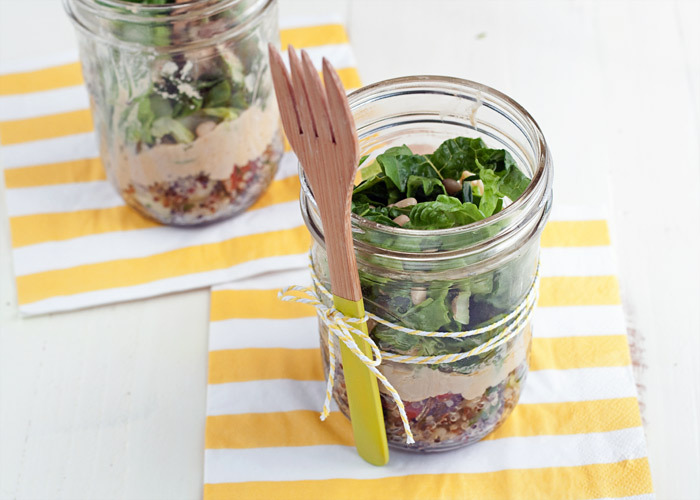 I adore mason jar salads, not only because I love mason jar everything, but because they really are a truly awesome way to make ahead and transport a super healthy lunch. This version is almost like a mini grain bowl on the move. It’s got a healthy scoop of tabbouleh at its base, followed by a schmear of hummus. Lord, I hate the word schmear, but I felt I had to use it here. Apologies. Then, we’ve got some spinach and romaine and finally, just because we deserve it because we are so TOGETHER, we get some toasted pine nuts tossed on the top for good measure. 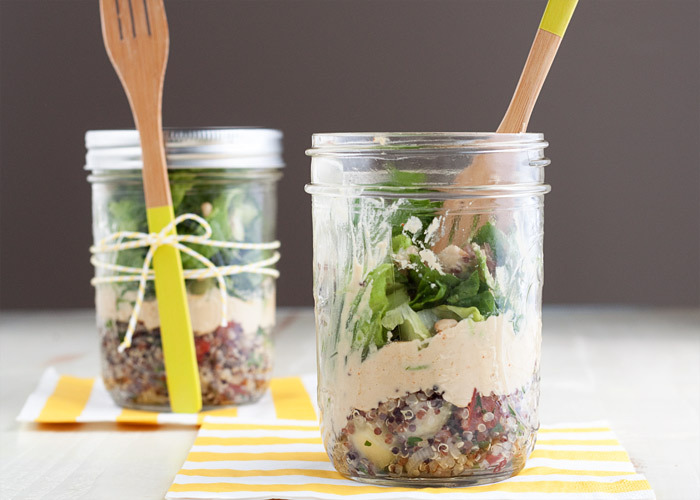 I use my Quinoa Tabbouleh and Classic Hummus for these mason jar salads, but you can use whichever tabbouleh and hummus you like. Mix and match for your very own fresh start! 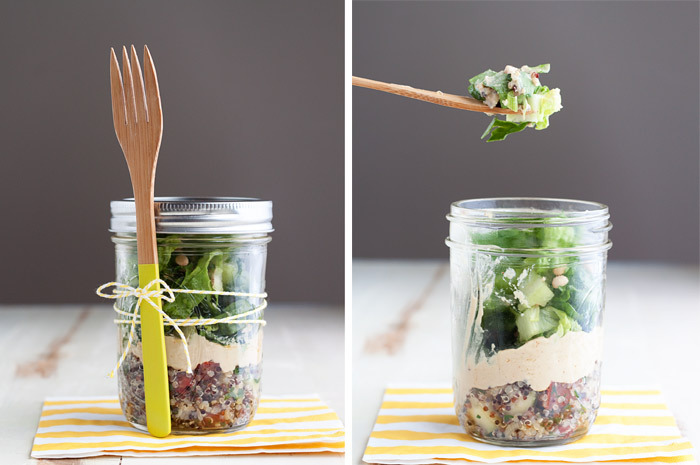 Divide the tabbouleh between the mason jars. Top each with the hummus. On the cutting board, quickly toss the romaine and spinach together and add to the jars, pressing down gently to get it all to fit in if needed. Top with pine nuts. Add lids and bands and seal. 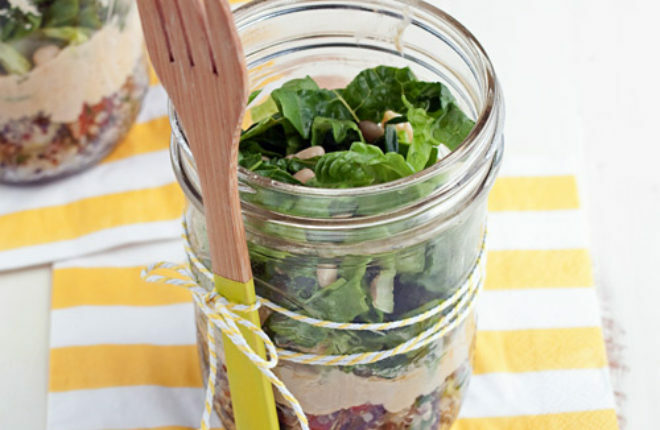 Salads keep refrigerated for 3-4 days. * To toast pine nuts, place them in a small skillet over medium-low heat. Cook, stirring frequently, until light golden, 3-4 minutes. Remove from heat before they get too brown as they will continue cooking a bit after you’ve removed them from the heat. The salad should be gluten-free if you use quinoa tabbouleh. Traditional tabbouleh made with bulgur is NOT gluten-free.